SEATTLE -- The first calf born in three years to the endangered orcas that spend time in Pacific Northwest waters died Tuesday, the latest troubling sign for a population already at its lowest in more than three decades. A dead whale was seen being pushed to the surface by her mother just a half hour after it was spotted alive in the waters off the coast of Victoria, British Columbia, said Ken Balcomb, senior scientist with the Center for Whale Research on San Juan Island, which closely tracks each individual whale. The mother was seen propping the newborn on her forehead and trying to keep it near the surface of the water, he said. "The baby was so newborn it didn't have blubber. It kept sinking, and the mother would raise it to the surface." The distinctive black-and-white whales have struggled since they were listed as an endangered species in the U.S. and Canada over a decade ago. They're not getting enough of the large, fatty Chinook salmon that make up their main diet. They also face threats from toxic pollution and noise and disturbances from boats. A statewide task force formed by Gov. Jay Inslee has been meeting since spring to come up with ways to help the population. Efforts include slowing down state ferries to reduce the effect of noise, increasing hatchery production of salmon, training more commercial whale-watching boats to help respond to oil spills, and prioritizing areas where important habitat can be restored to help fish and orcas. Balcomb and others say more aggressive measures are needed. They have called for the removal of four dams on the Lower Snake River to restore salmon runs. There are just 75 of the orcas, down from 98 in 1995. The number is a concern, but the bigger issue is the reproductive status of the small population, Balcomb said. There are 28 whales of reproductive age, and only 14 have produced calves in the last decade. Female orcas have had pregnancy problems because of nutritional stress linked to lack of food. Half of the calves born during a celebrated baby boom several years ago have died. Until Tuesday, no other calf had been born in three years. "We know they're getting pregnant. They're not having viable calves," said Balcomb, whose centre keeps the official census of the southern resident killer whales for the U.S. government. "That is really devastating. Without reproduction, there's no survival in the population." The southern resident killer whales are distinct from other orcas because they eat mostly fish, rather than seals or other marine mammals. Individual whales are also identified by unique markings or variations in their fin shapes, and each whale is given a number and name. Their movements are closely tracked and photographed by legions of whale watchers and fans as they appear in Puget Sound from spring to fall. Last year, the endangered orcas spent the fewest number of days in the Salish Sea that spans Washington and Canada in four decades, mostly because there wasn't enough salmon to eat. 'Deliriously happy': Elizabeth May gets married in B.C. 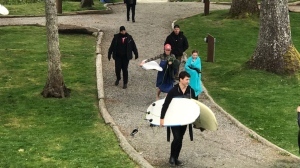 Prime Minister Justin Trudeau was spotted surfing in the western Vancouver Island community as his family vacationed there for Easter long weekend.